[Solved] Spotify Stuck in Full Screen - A couple days ago, I'm facing the problem with this App. Every time I turn on my computer and login to my Linux ( Elementary OS ) the main Spotify window always appears maximized. All of we know, Spotify is a digital music service that gives you access to millions of songs. With Spotify, it’s easy to find the right music for every moment on your phone, your computer, your tablet and more. It runs on Linux, Mac, Windows, and any mobile phones such as Android and iOs. There are millions of tracks on Spotify. Whether you’re working out, partying or relaxing, the right music is always at your fingertips. Choose what you want to listen to. 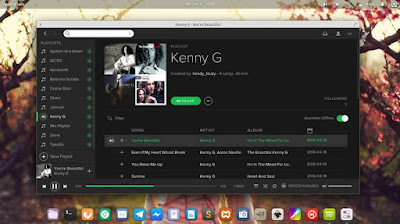 Step 1 - First, close the Spotify app on your Linux. Step 2 - Launch your Linux file manager : Pantheon, Nemo, Nautilus, Dolphin, Thunar etc. Step 3 - Go to home directory, then press Ctrl+H to show the hidden directories. Now open Spotify and viola, it back to normal window!. It's all I can write about how to fix Spotify music app error- get stuck in full screen / always starts maximized. Hope this post can solve your problem. Thanks for visiting Linuxslaves!